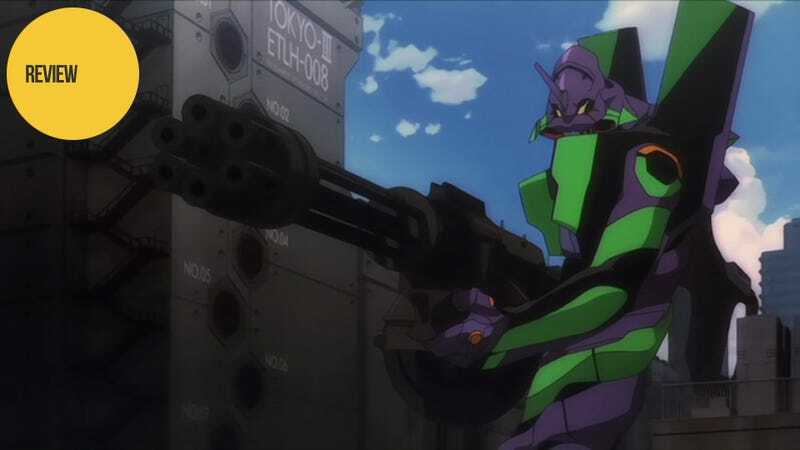 With just under two weeks until the release of the newest Evangelion movie, Evangelion 3.0: You Can (Not) Redo, we at Kotaku East are taking a look back at the previous films in the Rebuild of Evangelion series. When I talked about my history with Evangelion a week or so back, I mentioned my dislike for the first of these movies, Evangelion 1.11: You Are (Not) Alone. Ever since I saw the film for the first time, I felt it was just a prettied up, shot-for-shot compilation of the first six episodes of the series. Moreover, it was an abridged one to boot, with the movie a full 31 minutes shorter than the same section in the series. So I couldn't understand why anyone would watch the movie when they could just watch the series instead. Sure it would look a little worse, but you would get a more developed story. After I wrote that article, however, fans were eager to point out that I had missed the subtle differences between the film and series—and that these differences have major, world-changing implications for the series as a whole. While I had watched You Are (Not) Alone only a few months back, it had been several years since I watched the series. Moreover, I had never watched either the series or You Are (Not) Alone with the specific intent of comparing the two. So perhaps there was something I had missed all those years ago when I first formed my opinion. There was only one thing to do. This past weekend I sat down to do something I had never done before, watch both the first six episodes of the series and the film back to back. The first thing I noticed upon starting the series was how good it looks, even to this day. While You Are (Not) Alone does look clearer and more detailed (especially in the backgrounds), it is also far darker—so dark, in fact, that entire portions of the movie were unwatchable until I turned off all the lights and drew the curtains. This is not bad, per se, but it is odd how many scenes that happen in the day in the series happen at night in the film. Besides the color palate, I was surprised to see how many other changes there were. For the sake of a tighter narrative, many of the scenes are re-ordered, removing the series' mixed chronology moments. In addition, many lines were tweaked slightly as a means of exposition and the pace of many conversations has been sped up—completely removing the common, awkward dead air of the series. In the story itself, the world is far worse off, with the seas red and the majority of sea life killed off. The series shows the opposite, with sea life recovering. Pen Pen the penguin is called a new species in the series while in the movie he's called one of the last of the old species. Moreover, the human world is shown in a far more dilapidated state in the film, with the older cities falling into disrepair and the destroyed cities being left in ruins. But what perhaps affected the story the most are the things that were cut entirely—especially as it pertains to Shinji as a character. The most striking is Eva 01's hand not moving on its own to protect Shinji from a falling ceiling like it did in the series. This changes the scene—and Shinji's motivations—drastically as Shinji now gets into the Eva for the first time to protect the injured Rei with no expectation of help from the Eva itself. Many other cuts also serve to make Shinji a stronger character. The vast majority of his whining lines have been removed, making it more about the character struggling to find meaning in his life rather than simply complaining about it. Also cut is the vast majority of his time spent running away from his responsibility/emotional pain (which took a full episode in the series). Instead, he makes the choice to return to Nerv moments before they pick him up; and when Misato tells him to leave if he doesn't like his situation, he doesn't even consider it. While I have little doubt that most of these cuts were done for time rather than any kind of authorial intent, they serve to make Shinji a stronger person while still preserving his internal conflict. This new Shinji is made even stronger by his portrayal in the final part of the film, which is actually the only part longer than the episode on which it is based. He is hurt far more by the 6th Angel than in the series and is naturally hesitant to enter into combat again—this time running away from physical pain on top of the pressures of having to protect the city alone. Yet after being shown what is truly at stake (the fate of all life on earth), he overcomes his fear and gets back into the Eva. Even when shot again in the subsequent battle, he refuses to give up. But as Rei protects him from a third shot and takes on the full brunt of the physical pain herself, Shinji learns, that despite what he had believed, he is not alone—not in pain nor responsibility. Some additions not related to the main cast serve to add mystery like: "Why is the outline of a dead angel on a hill before the angels have even arrived?" or "Why is Kaoru chillin' on the moon—and why does he already know who Shinji is?" Others add foreshadowing (like the discussion about the dummy plug) or a look into Shinji's mind (the new train car scenes). In the end, after doing a direct comparison, I found that I enjoyed Evangelion 1.11: You Are (Not) Alone far more than I expected. In fact, truth be told, I found it more enjoyable than the first six episodes of the series. It looks better, is better paced, and better defines Shinji's physical and emotional struggles. Moreover, Shinji comes out of it a much more likable (and therefore identifiable) character. Upon my first watch of the film, I complained about there being any cuts at all, but for the most part, these cuts were just of exposition or long silences—neither particularly necessary for the story. If there was anything that I felt was done better in the series, it was the handling of Shinji's middle school life, from him being a class celebrity (as an Eva pilot) to his friendship with Toji and Keisuke. Regardless, the next time I sit down to marathon Evangelion, I plan to skip the first six episodes and watch Evangelion 1.11: You Are (Not) Alone instead. Evangelion 1.11: You Are (Not) Alone was released on Blu-ray and DVD on March 9, 2010, in the United States.